At least the money is going to charity - otherwise we would question this buyer's sanity. We’ve seen many bewildering BMW Art Cars over the years, and while this latest effort isn’t part of the official BMW Art Car family, it’s still very, very bizarre. Recently sold at the Leonardo DiCaprio Foundation’s Fourth Annual Saint-Tropez Gala auction was this BMW i3 wearing a vinyl wrap covered in close-up images of spaghetti. Appropriately named the “BMW Spaghetti Car,” it was designed by artists Maurizio Cattelan and Pierpaolo Ferrar. Just wait until you find out how much it sold for. Admiring his creation, Cattelan commented at the 2016 event: “This is by far the best Spaghetti Car I have tasted! All those years of perfecting definitely paid off! Totally awesome!” The Gala was hosted by Leonardo DiCaprio, who was joined by special guests including Adrien Brody, Sean Penn, Taylor Hill, Iman Hamman, Gerald Butler, Kate Hudson, Lenny Kravitz, and Madonna. As we already mentioned, the BMW i3 Art Car isn't classified as an official BMW Art Car. The most recent entry in the BMW Art Car series was an M6 GT3 inspired by Asian spiritual ceremonies with swirls of light that can only be viewed in augmented reality. 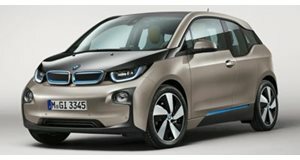 The BMW i3 is sporty, compact, comfortable – but far from being the most affordable electric car on the market. This is one superb cone-weaving hatchback.